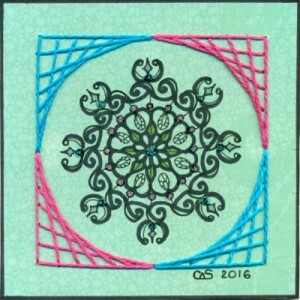 I have been participating in the Inchie-A-thon that is going on over at ATCsForAll.com (which continues through Jun 22). 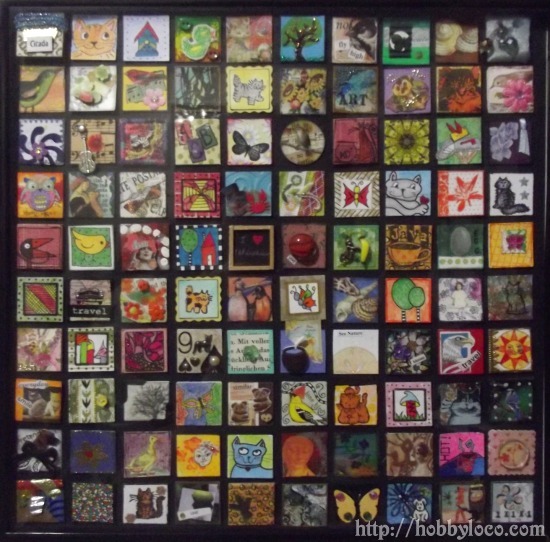 An “Inchie-A-thon” is an online art party where artists gather in an online forum to make, share, and trade art. Because artists from around the world participate, the party goes on around the clock. You can play a little while or all week – depending on your schedule and interest. Above is shown the coolest thing I made over the weekend. 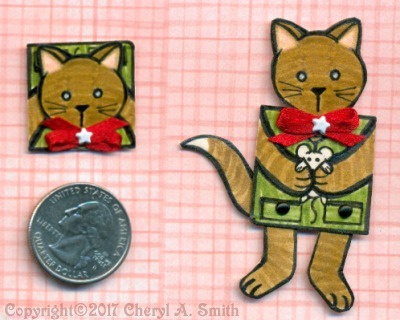 An inchie sized (1″ x 1″) kitty cat paper doll. The head, bow, legs, and tail are attached with mini brads. It was surprisingly simple to make. Most of my inchies were drawn with Faber Castell Indian ink pens and colored pencils, a couple were made with printed image and text collage. 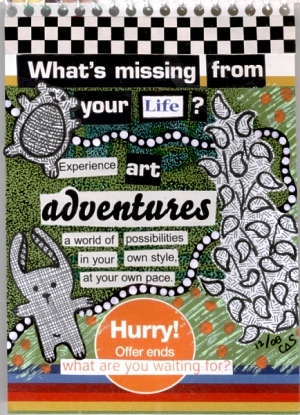 Awhile back (circa 2008), I made this little art journal from my junk mail. I gathered all the little postcards and card stock weight ads that collected near my computer, cut the larger ones down to size (approximately 4″ x 6″). I punched and bound them into a little book. *The photo above shows the plain book right after binding. There are 11 cards bound into the book – one folds out to double its size. I decided to play around with some of my paper scraps and see what developed. This page was made from scrapbook papers, newspaper clippings, a sticker, stamping, doodles, Indian ink pens, a paint marker, and sparkly gel pens (the entire fish is colored with sparkle). 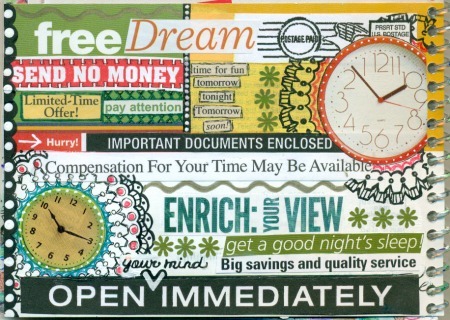 Just magazine and catalog bits glued to a piece of junk mail, with a bit of doodles thrown in for good measure. I started cutting skulls from magazines and catalogs, and pasted them on the page. I added a layer of gesso tinted with a drop of blue acrylic paint to blend the background layer. 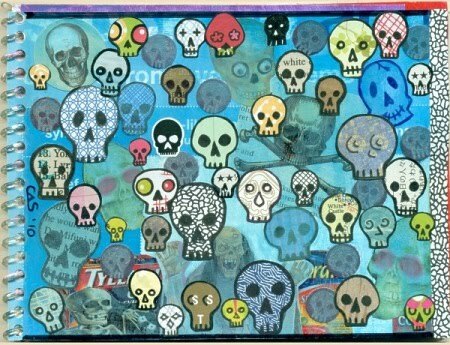 I then drew skulls with pens and markers on pieces of junk mail and paper scraps, and pasted them all over the page. This page is made up of collage, paint and doodles. All of the text was cut from junk mail. The doodles were drawn on the pattern side of security envelopes from junk mail. The page itself started out as a sales postcard. This was one of the first pages I worked on. 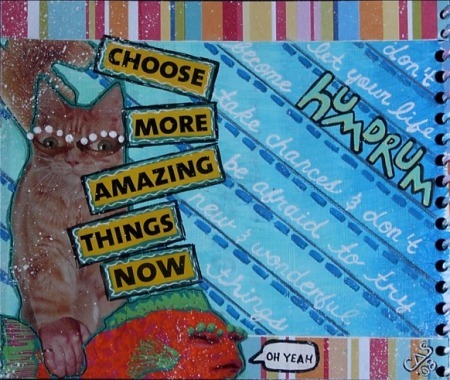 It features a collage of scrapbook paper and magazine clippings, with acrylic paint, Indian ink and paint pens. I have a large collection of journals, junk journals, notebooks, and doodle books. I hope to have time to feature more pages from them soon! 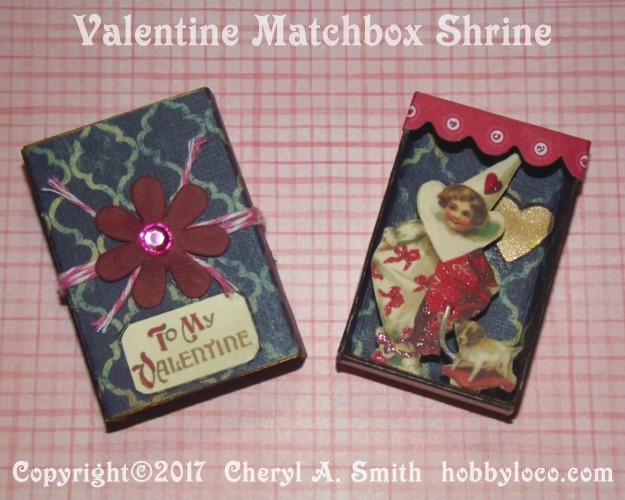 This pocket shrine was made from a standard matchbox measuring about 2-1/8″ tall by1-1/2″ wide and 1/2″ deep. I covered the box with printed scrapbook paper, which I also used for the inside background. I added a touch of metallic gold to the edges. Materials used in the making of this pocket shrine include printed images, glitter gel pens, punched shapes, string, and a rhinestone. As I was sorting through a box of random beads and broken jewelry, I came across this large purple bead with gold splatters on it. I felt inspired to use it in a project and started to gather color coordinating bits and pieces. What evolved a few hours later is this “Lavender Lovely”. I used heavy black jewelry wire to attach some broken jewelry pieces for legs. I ran the wire through some purple buttons and the large purple bead, which I used for the body. 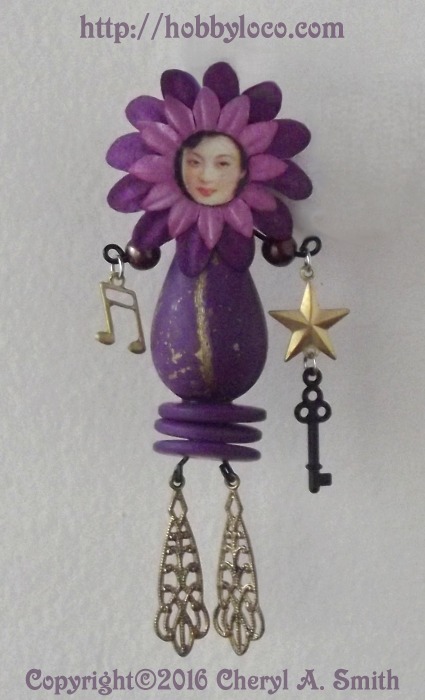 I attached beads and charms for the arms and added a loop in the back for hanging. I nested two paper flowers and glued them to the top of the bead to frame the face. I used a 1/2″ circle punch to cut the face from some printed material I had on hand. After I glued the face to the center of the flowers, I coated it with Diamond Glaze to seal and add some shine. I have traded many inchies over the years. I currently have 6 frames, holding 100 inchies each, hanging on the walls in my apartment. Inchies are miniature artworks that measure 1 inch square. 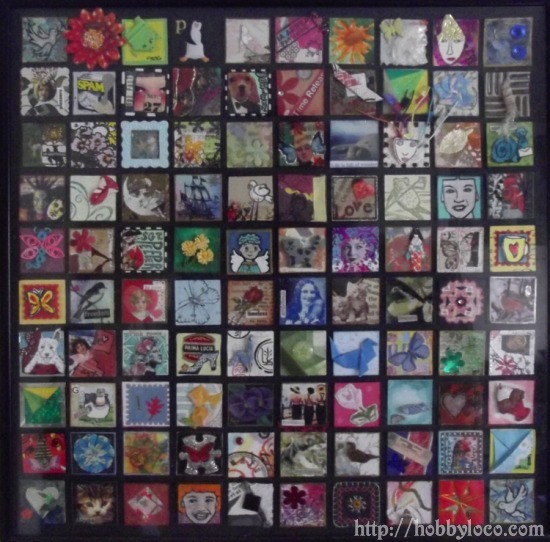 Inchies can be drawn, painted, stitched, beaded, collaged, made with Origami or cut paper, made from polymer clay, metal, or any material that you can think of. Inchies can be flat or dimensional, they can be interactive and fold or slide open to reveal a hidden area. Most commonly inchies are drawn, collaged, or painted on card stock or other firm strata such as watercolor paper or recycled boxes, that has been cut or punched to a one inch square size. I made several chunky pages for a Mandala chunky page swap at ATCsForAll.com (swap open until March 23rd). 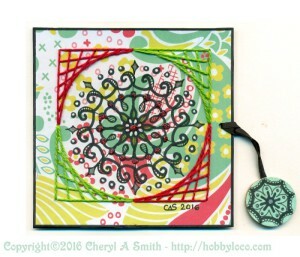 Finished chunky page made from doodled Mandala with string art. 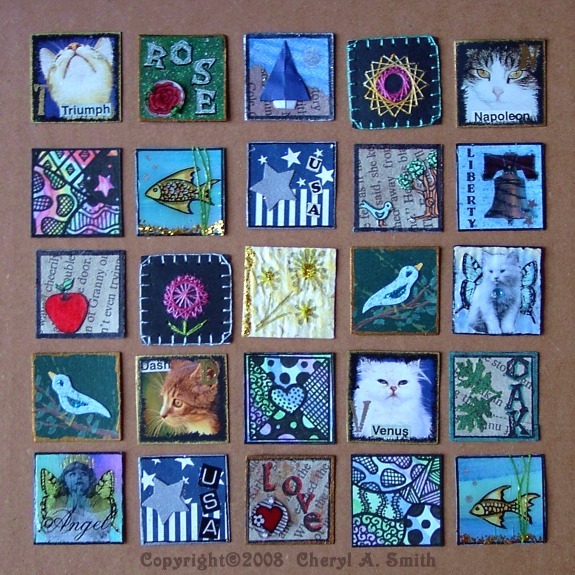 I started with re-purposed cardboard from cereal boxes, which I cut to 4″ x 4′. I lightly sanded the printed side to help the glue adhere better. 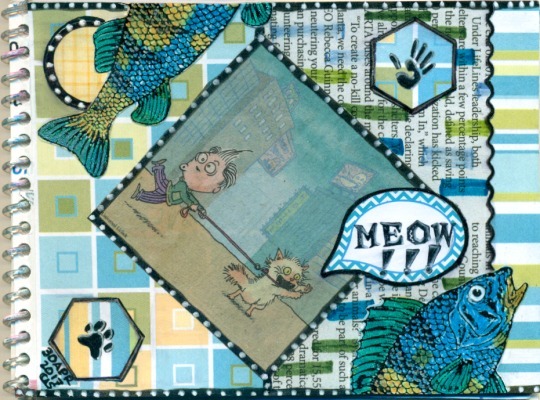 I then glued printed scrapbook papers over the cardboard. I doodled the Mandalas with a Sharpie marker and an Indian ink pen. I added a little bit of sparkle with a Gelly Roll pen and some glitter glue. I added the string art by punching holes with an awl along the border, and then stitching craft thread through the holes. 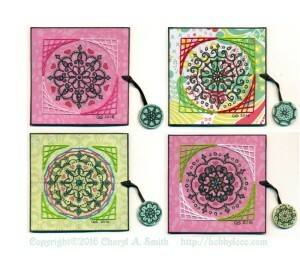 For the finished pages I added small Mandala charms. 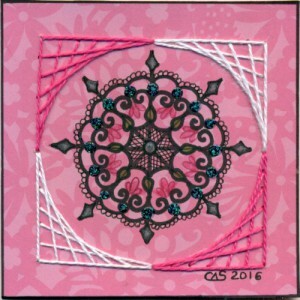 I made them with 1″ circles punched from cardboard covered with printed scrapbook papers and doodled with mini Mandalas. I sandwiched satin ribbon between the layers and looped it through punched holes in the page.